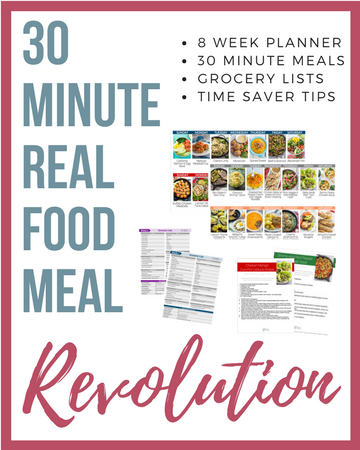 Dinner in under 20 minutes! 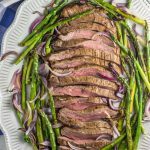 This sheet pan flank steak with onions and asparagus is the perfect paleo and Whole30 dinner to make and serve with minimal effort. 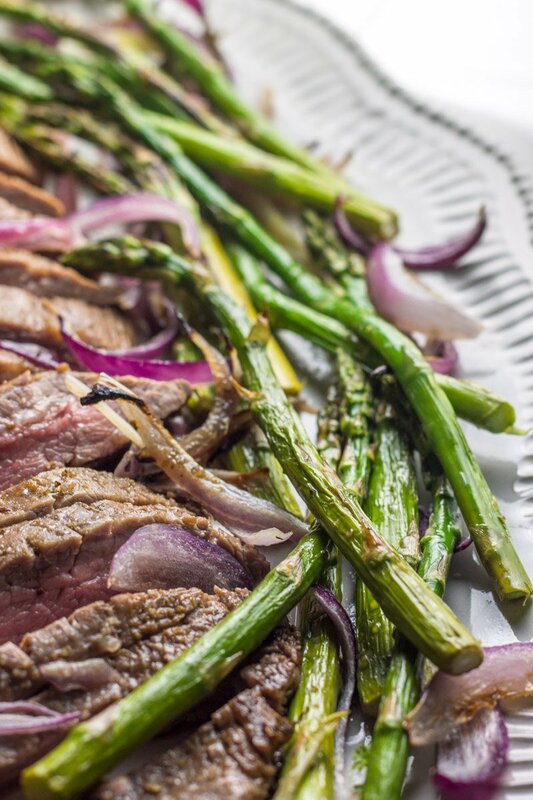 Tender steak with perfectly roasted veggies is a meal that will definitely be on rotation. It’s been SO long since I posted a sheet pan recipe. I don’t know what I was thinking – I LOVE sheet pan dinners but I somehow forgot about this little love affair my baking sheet and I had. Plus I’ve been a little chicken about it because I typically only make sheet pan meals with chicken. And I can’t think of another chicken reference to tie this all together so let’s switch gears and talk about beef. I’ve done flank steak in a crockpot. And I’ve seared skirt steak in a cast iron. But never, EVER have I attempted steak in the oven. But now I’m MAD. I’m mad I haven’t done it before. 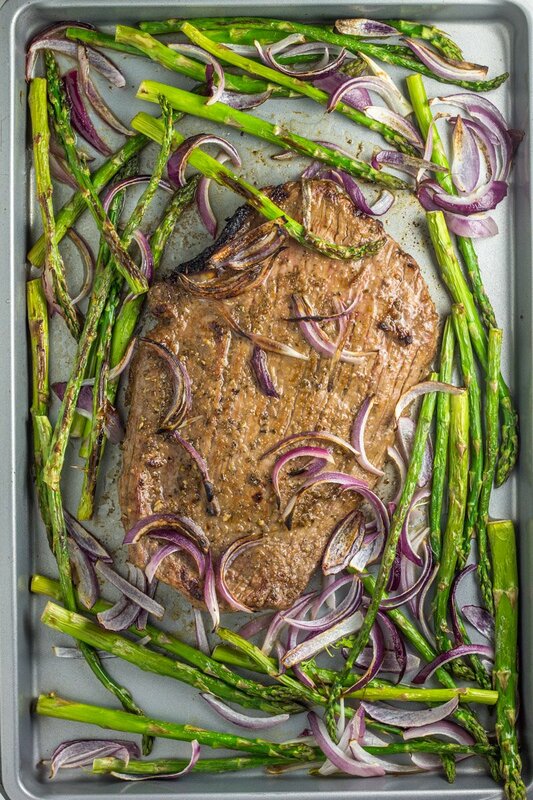 And I don’t want you to be mad at yourself either, so that’s why I must share this sheet pan flank steak with onions & asparagus recipe. It’s a game changer folks. Life changer. Steak changer. I can’t believe how perfect this big ‘ol hunk of meat came out. Cooked to perfection, juicy and flavorful, and the complimentary veggies were roasted to perfection. But the best part? Dinner in under 20 minutes (and if you are super efficient, you could probably bust it out in under 15). NOT KIDDING. THIS IS NOT A DRILL. No grill needed, no advanced culinary skillzzzz required. Just an oven and a sheet pan. Simple as that. Marinating the flank steak all day packed it with major flavor, so much in fact, the asparagus needs no extra help. 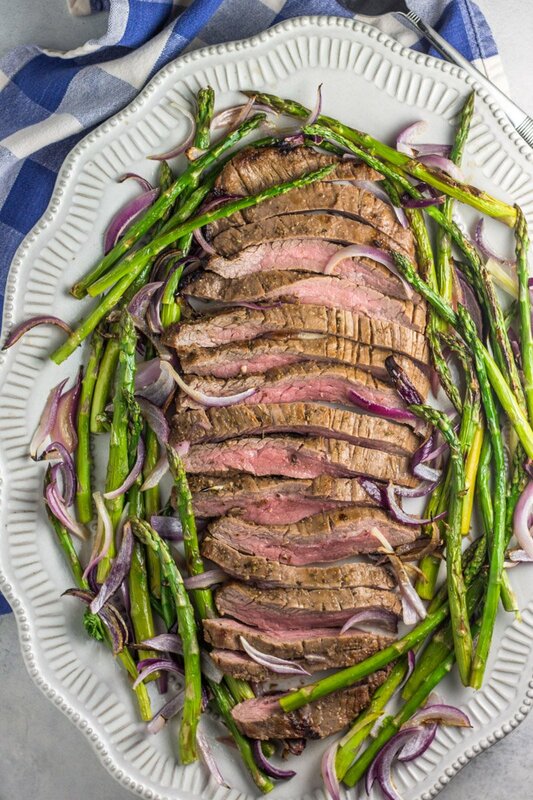 The marinated steak paired with the savory yet sweet sliced onions and PERFECTLY roasted asparagus is a beautiful combination for ‘yo taste buds. Aaaaand it’s paleo and Whole30 compliant. This recipe is a must for big families or serving a crowd. Or if you have a husband like mine that eats like a small clydesdale. They key is to set your oven to broil on high (mine hits around 550 degrees) and heat the pan before adding the steak and veggies. Then pop it back in the oven for 6 minutes (medium rare) or 7-8 for a well-done steak, then enjoy! 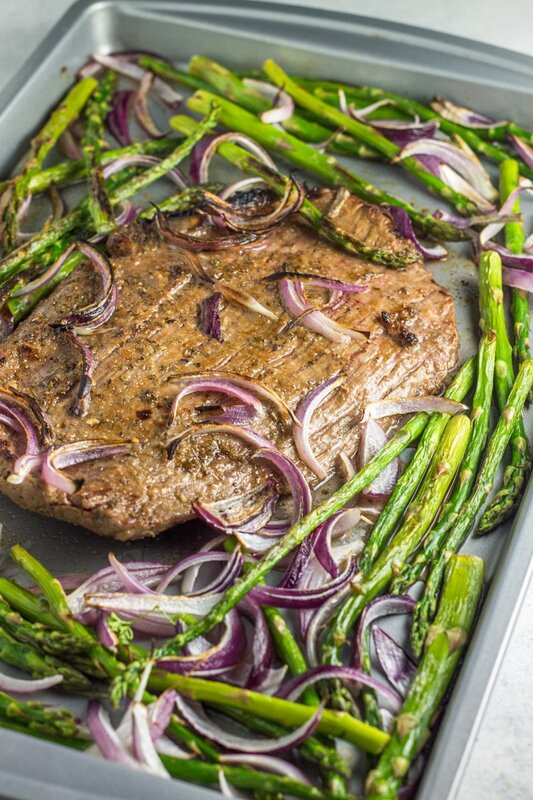 Sheet pan like this sheet pan flank steak with onions and asparagus meals your go-to? Then be sure to also make this Autumn Roasted Veggie Sheet Pan Chicken with Raisins, and this Sheet Pan Salmon with Dijon Cream Sauce. 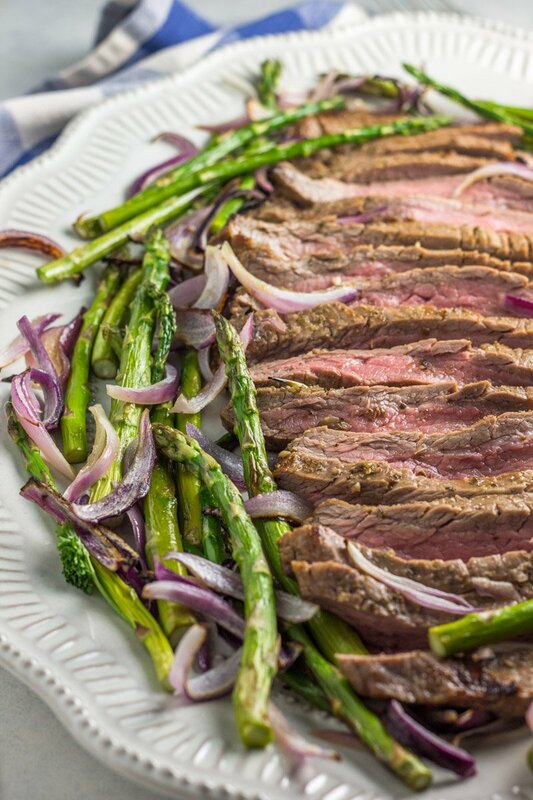 This simple yet flavorful Sheet Pan Flank Steak with Onions and Asparagus dinner is a paleo, Whole30 meal made in under 20 minutes. I’m so glad you liked it Megan! I’m making this tomorrow – can’t wait! Question: if my family doesn’t like asparagus, is there another veggie that I can cook with this? Thanks! Trying this next week! Hmmmm as long as it isn’t a hard root veggie (like carrots, sweet potatoes, etc). You’ll want something that will cook quick. Maybe try green beans! Sounds easy enough and we LOVE asparagus.. Hubby might be mad he doesn’t get to grill something lol but we’ll give this a try. Thanks! Where do you buy your flank steak? I cant seem to find this cut of meat. I have made this 3 times in the last 8 weeks! Soooooo good! You found a winner! So glad you like it Dana! I loved this so much. The marinade was especially tasty. I love a medium rare steak, but mine was never quite done. I had to keep cutting off the medium rare ends and putting it back under the broiler to cook a bit longer. Some parts of the (mostly the middle) were way too rare. Can you suggest some tips…..I do not want to grill it. That’s my husband’s job too! 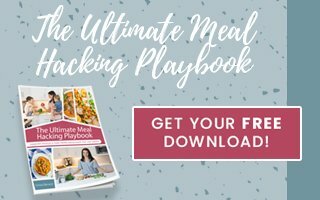 Please let me know as I really do love this recipe! Thanks! Sounds like your flank steak is quite varied in thickness. Next time try pounding the thickest part, so it’s more uniform for cooking and will yield a better result.